Whether shopping online, connecting with friends, accessing the latest product information, or viewing the latest digital entertainment, today’s users expect the best. They want rich, dynamic content and fast, reliable applications. And, they want this on any device, at any time, and from anywhere. Today, companies of all sizes and industries struggle to deliver the rich digital experiences that consumers expect because they lack an efficient way to manage the delivery and optimization of their content and user engagement. 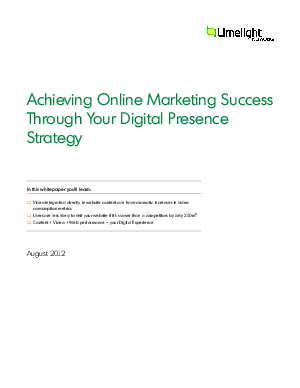 They have had to use multiple stand-alone technology solutions to accomplish their Digital Presence goals. As a result, managing, delivering, and optimizing their Digital Presence has become complicated, expensive, and time consuming especially as audiences expand globally and platform types multiply. If you are going to invest the time and resources into developing the right Digital Presence for your organization, you have already established a clear vision of what your new Digital Presence will look like. But, have you thought about how you will manage, optimize and deliver it in a unified way across social media, mobile, and web channels?